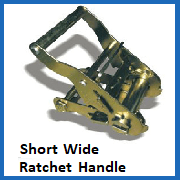 The ratchet handle fittings we sell form an important part of our range of ratchet straps. There are available in different shapes and sizes to suit a number of varied applications. 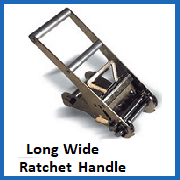 We can create bespoke ratchet strap assemblies to go along with the handles you choose. 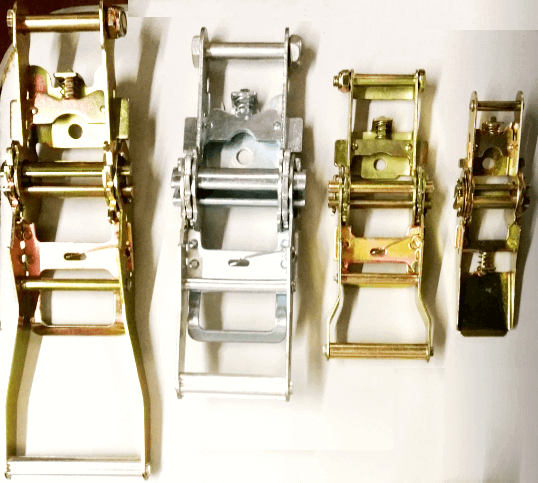 Ratchet buckles are essential in ensuring that straps can be tightened securely and create a safe restraint for storage or transport purposes. There are many ratchet handle fittings options to choose, not only in terms of the configuration of the handle and the design of the buckle, but also the type of material that is used. From long, wide handles that allow you get maximum leverage and power, to short, narrow handles that are compact and provide a minimal amount of obstruction when in use, you are bound to find what you need on our site. 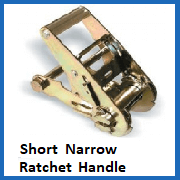 You can select the ratchet handle that you need if you are replacing a part from an existing assembly. If you need an entirely new strap, complete with handle and locking mechanism, we can also supply you with a custom product put together by our experienced team. Both locking and pull-to-release mechanisms are available for added variety of choice. Looking for Advice on Ratchet Handles? Rope Services Direct can help you out with any ratchet handle issue you might have, even if you are not familiar with this type of product. Contact us by calling 01384 78004 or through the form on our site to get assistance from the experts! Ratchet Handle Fittings Overall rating: 5 out of 5 based on 6 reviews.